Rhubarb is rarely eaten raw. To prepare, first remove all the leaves, rinse and pat dry. Trim the ends and cut into 1-inch chunks. If it is stringy, just remove the tough strings as you would with celery. However, the strings will usually break down during the cooking process. Stew or bake with a little water and plenty of sugar to combat the tartness. Rhubarb can quickly cook down into a syrupy liquid, so keep an eye on it if you need it to retain some texture for specific recipes. If you sweeten rhubarb after it is cooked, you will need less sweetener. Generally, the redder the stalk, the less sweetener is needed. Hothouse rhubarb should not have it, but rhubarb grown in the field often has tough strings running down the stalks, much like older celery. These strings should be removed before cooking. Field-grown rhubarb will have a more predominant flavor than hothouse. 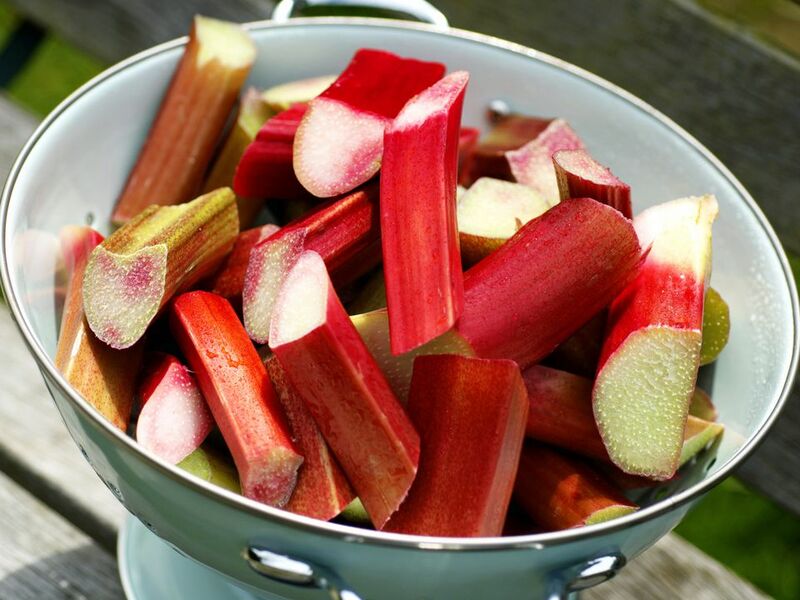 One pound of raw rhubarb will yield about 3 cups of chopped raw fruit or 2 cups chopped cooked fruit.